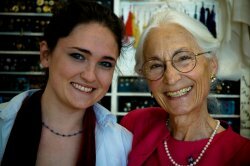 Since 1974, Elfriede's Fine Fabrics has been providing the Boulder, Colorado, sewing community with extraordinary quilting and garment fabrics, as well as a large assortment of notions, buttons, trims, lace, and other embellishments for heirloom sewing projects. 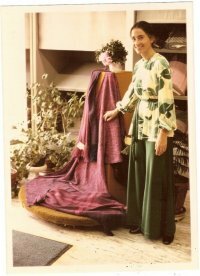 Elfriede left a successful career as as research biologist to establish an independently owned and operated fabric business, at Water Street Plaza (right across from McGuckins), where, for over 40 years, she's been inspiring stitchers of all ages, styles, and skill levels with expert advice, contagious enthusiasm, and attentive, professional service. She strives to provide our customers with the highest quality fabrics the industry has to offer, while maintaining reasonable prices that are affordable for all. Elfriede's Fine Fabrics specializes in helping sewists bring their creative ideas to life! Our passion to help others succeed is always rewarded with the satisfaction of watching customers and students proudly wear garments made by their own hand. We have a talented staff that specializes friendly, personalized assistance, helping with everything from fabric selection and project ideas, to color coordination and new sewing techniques to ensure a pleasant and rewarding sewing experience for everyone who walks through our doors. For the convenience of those not in the Boulder area, we are happy to send out samples of our fabrics. Just contact us with your request and we'll do everything we can to help you find the products you're looking for!